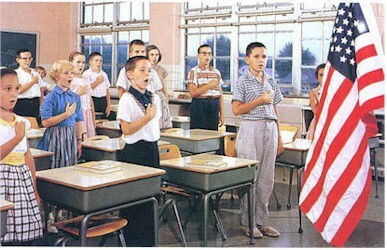 to the Pledge of Allegiance (1954) ? I don't pause. I go right on. And very loudly. Ike and the boys had no business mixing Church and State, just because they were scared of Commies. The thing about saying "One nation..." is not necessarily passe. Now, if your religion is non-Christian or you just prefer not to say it, you aren't forced to say it. Just pause during that part and go on later. The only reason that "under God" was added was to show we weren't like those "Godless Commies" during the height of McCarthyism and the Red Scare. It's long past time to remove it, but then again, why should anyone in a democracy be expected to pledge his allegiance anyway? That smacks of dictatorship. although it was easy to learn, "under god" never seemed right, I was not, nor am I now an atheist, it just didn't seem right to add god into the pledge. To this day, I will stand and pledge my alegience to my country, but I am silent when it comes the aforementioned phrase. I guess the earliest I actually remember doing this was in sixth grade. We took turns as leader saying the pledge of allegiance, read a verse or two from the Bible, and said the Lord's Prayer. Have times really changed since then. I think those things need to be allowed again. I don't remember near the problems we have now in school, and surely not guns being brought to school. Worst we could do in high school was smoke a cigarette. I am beginning to believe the 50's and 60's were the "good ole days" as far as I am concerned.